From the moment popsicle fever took hold of me earlier this year, I have been aching to play around with so many different cocktails in popsicle form. The primary obstacle has been the kids – they see popsicles and instantly want to devour them. I knew the idea of an adult-only popsicle would not be well received. But, with good quality ripe peaches finally arriving in our produce bins, I simply couldn’t wait any longer. Thankfully having possibly the best ice cream ever on hand has served as an adequate distraction. 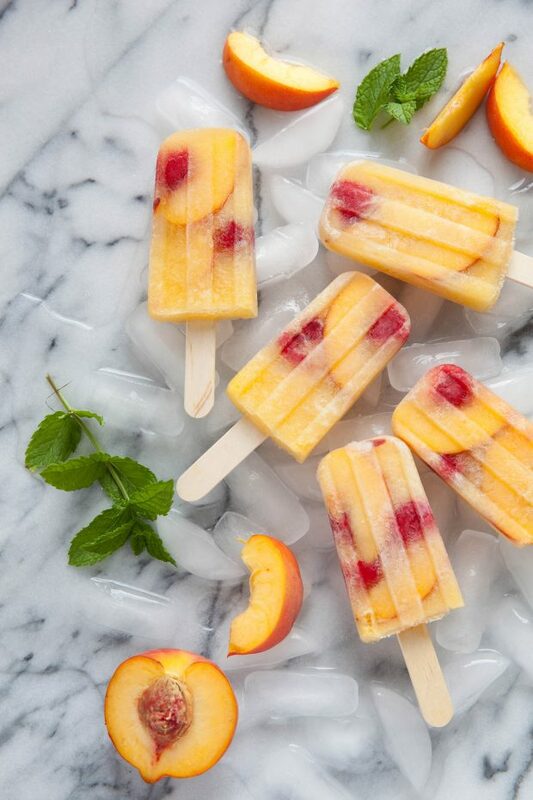 After a long day of work followed by a few hours of kid wrangling, or a weekend day of non-stop kid wrangling, a cocktail popsicle seems like the perfect reward. 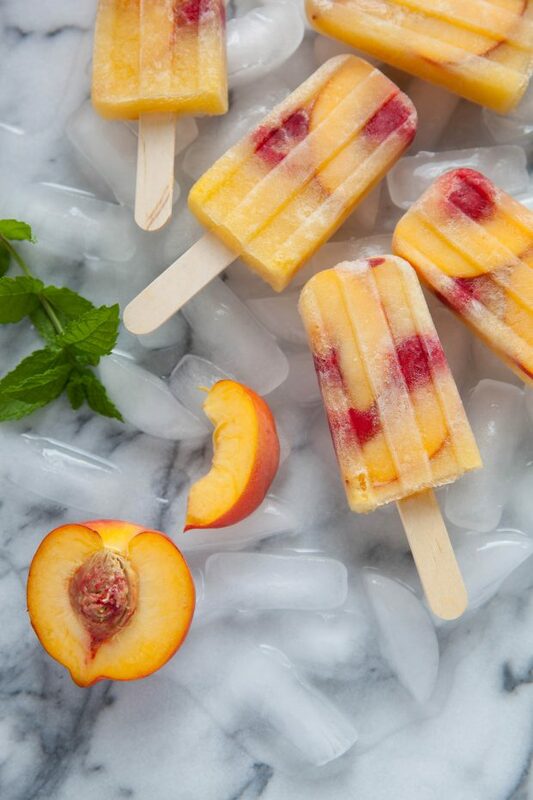 These are exactly what I was hoping for – a peachy, potent icy sweet treat. These would be perfect for a summer girls’ night. Any of my friends who want to come over and share, feel free! But hurry – I doubt they’ll last long. Favorite fruits – As with any sangria, this is highly adaptable. Try with nectarines or plums, other berries such as strawberries or blackberries. The possibilities are endless! Fresh herbs – Feel free to add in fresh herbs as you like. Fresh mint or basil could be a nice pairing. Spirited subs – Use whatever spirits you prefer in the sangria. If you like to use brandy or vodka in yours instead of schnapps, go for it! Pit and thinly slice 1 peach. Add to a bowl with the raspberries, sugar, and 1 tablespoon of white wine. Stir together gently (avoid smashing the berries or bruising the fruit.) Let stand about 20 minutes. Peel, pit, and coarsely chop the remaining 2 peaches. Combine in a blender or food processor with the remaining 1 cup of white wine and the peach schnapps. Puree until smooth. Pour the peach puree mixture into popsicle molds, filling each about 2/3 of the way full. Add a few peach slices and raspberries to each mold. (This is the popsicle mold I use. I love it!) Insert popsicle sticks* and freeze until fully set, at least a few hours. Unmold and enjoy!